Dr. Who "Hello Sweetie" wrap around solid .925 sterling silver band ring. River Song greeting to Dr. Who. .925 sterling silver, hand sawn from a sheet of 20 gauge (.81mm) sterling silver then hand stamped with HELLO SWEETIE. I then anneal the metal and shape it into a wrap around ring. Once formed, I oxidize (darken) the letters and texture the surface with a brushed matte finish. The inside of the ring is polished to a smooth, shiny surface with a contoured edge for a more comfortable fit. Please allow 1 to 2 weeks for me to create your ring. Usually closer to one week. I also have available a Rose Tyler "BAD WOLF" wraparound sterling silver ring. Such a delightful artist is at work here!! Her jewelry creations are unique and she is willing to design upon request. My package arrived today as promised. It was boxed and secured with silver ribbon and an anti-tarnish strip. 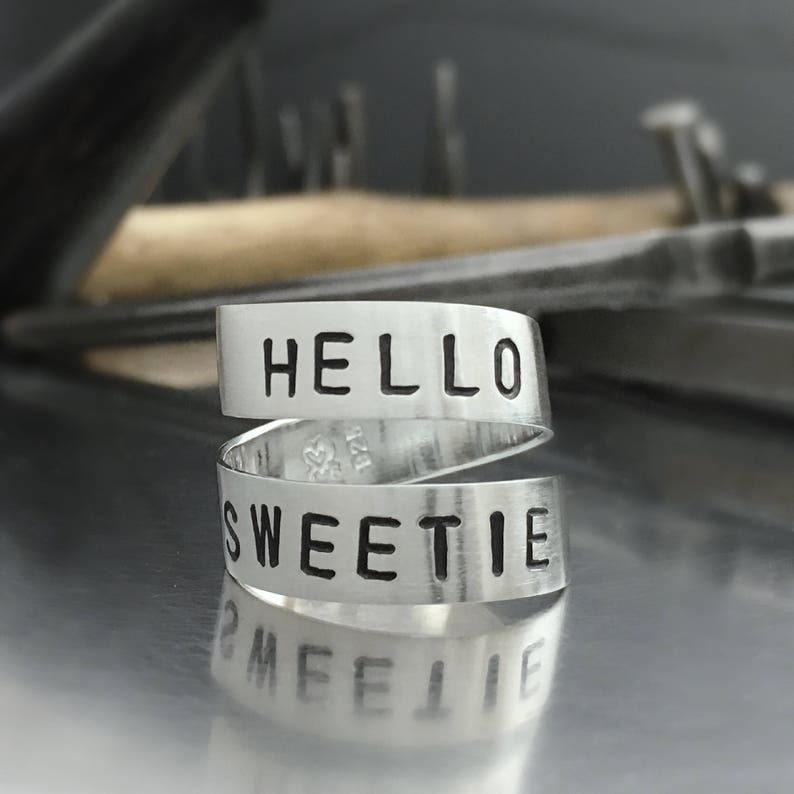 My 'Hello Sweetie' ring is a true work of art, surpassing even my already high expectations. This artist takes pride in her craft and it shows. I highly recommend her!